This is an area that will be updated as we go along and receive your comments after you have tried our rental or our tours. All of the people here are real and can be contacted by you for further information. We did an amazing self guided tour of Sicily. The bike, route, accommodation and suggestions were all great. It was quite busy, and we'll have to come back!! Very helpful and professional. Communication was good. The bike we rented was in excellent condition. Attended the tour Down to Sicily on Apr. 10 to 24, 2015. It was a great experience encompassing challenges, riding skills, new county and sights every day - not a dull moment nor wasted time. Francesco, Tour Host of CIMT was the most accommodating and skilled guide I have ever observed/experienced; great knowledge of the roads, terrain, accommodation operators and people in general. He does it all really well. 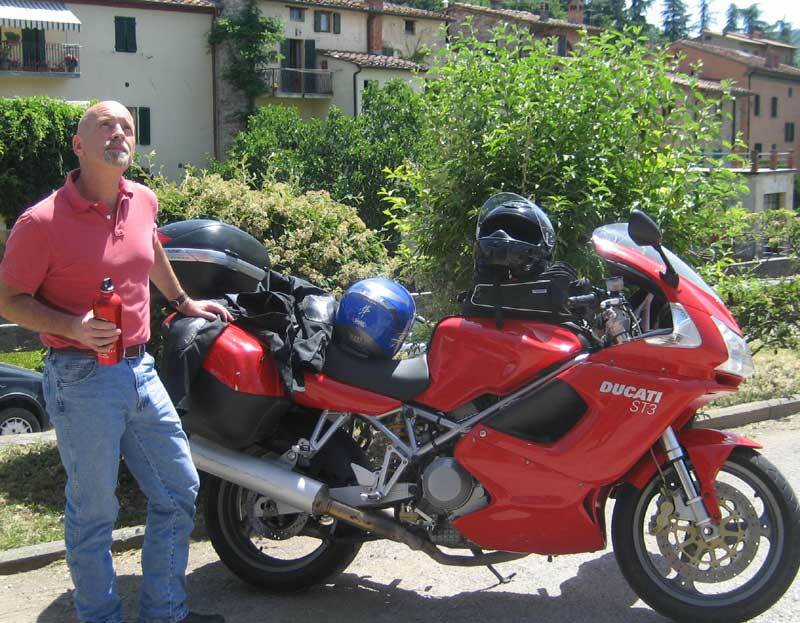 A friend and I rented a couple Ducati Multistrada's from Francesco for 3 days in Tuscany. We were excited that both bikes were brand new and had less 34Km combined. Pickup and return was a breeze. We saw a few of the other bikes and they looked just as nice. I would highly recommend CIMT and Francesco to anyone. They made that part of our vacation amazing! 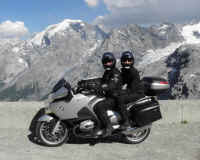 thank you CIMT for the wonderful, flawless bikes we rented from you recently on our trip riding the Dolomites. 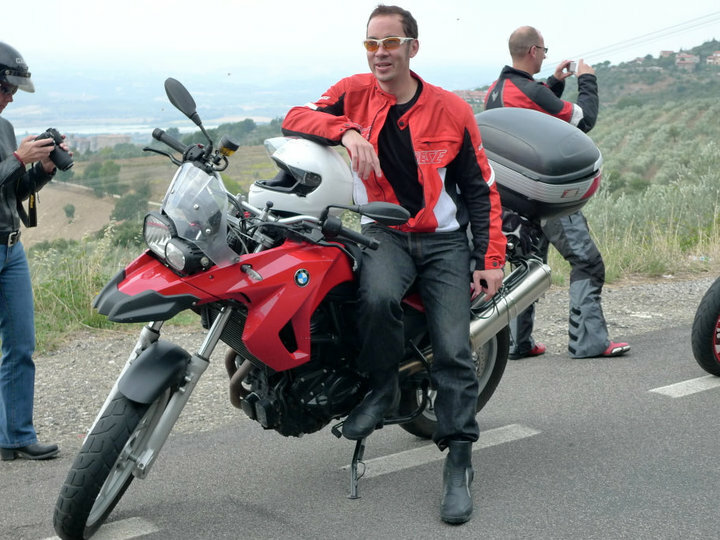 I loved the BMW S1000XR so much when i returned to the states i bought one! the sign up and pick up process was easy, the staff is professional and helpful, and the over all experience with the bikes was first class. see you next year! I just returned from a vacation in Milan. I wasn't planning on riding but the weather convinced me otherwise (Great riding weather for March). 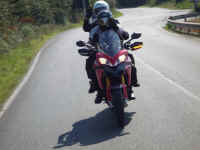 I phoned Francesco and withing one day of booking I was riding my usual, a well maintained, 2016 BMW R1200RT. I had no riding gear with me on this trip but they supplied that too. The new guy at the shop in Milano, Rodolfo, did an excellent job in setting me up. Oh and did I mention this was my third time dealing with CIMT? Keep up the good work Francesco. Ciao. Rented a BMW 1200 RT for a week. Best ride ever. Francesco was very good to work with. Do it, you will not regret it. Italy is a wonderful place to ride. 10/10 I had no problems what so ever. Everything was smooth and fast. Bike was new. Me and my wife were suppose to spend 3 nights in Florence. After 1 day of walking with sweaty tourists I said we need to rent a bike and go somewhere. I wanted a Ducati Scrambler and after calling several rental agencies this is the one that had it. I didn't book in advance, I just called Francesco in the evening before getting a bike early next morning and he said bike is ready and waiting. Next morning a very friendly guy (forgot his name - Simone) in the parking handed us a bike and two helmets. He also suggested to go west of Florence to the sea near Riomaggiore, so we did. Few hours on autostrada in one direction, Scrambler was not the best choice to be honest. Getting a bigger bike with big wind screen would have been more pleasing on a highway. But we got rewarded in the end - great scenery near the sea, had a swim as well. 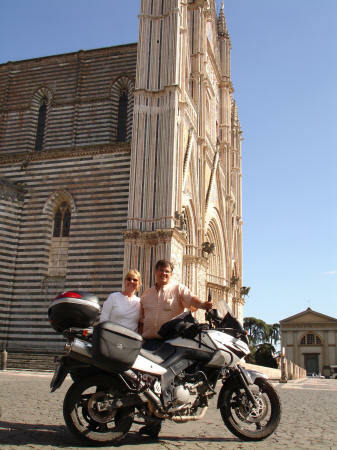 I highly recommend Central Italy Motorcycles if you want to get away from typical touristy Florence. Francesco in Florence was a big help in getting a bike for us on short notice and he made it easy. The bike (BMW 1200GS) was in great shape and we had no problems. We also rented gear and the helmets were nice and the jackets were warm. Francesco did offer us the GPS and we (stupidly) declined. Get the GPS, it's well worth it. I can't wait to get back to Florence and we'll definitely rent from CIMT again. We participated in the Grand Tour of Italy from Sept 22nd to Oct 5th. It was a fantastic tour!! Not only did Francesco lead us through the best riding experience I've ever had, but also showed us the most interesting parts of Italy along the way. He pointed out the historical significance of the areas, as well as the food and wine specialties of each region. He brought us to "out of the way" attractions that are real gems to see and experience. There's no way that we could have possibly seen and experienced this much on our own. Francesco had planned out a detailed tour for every day, however, he was very flexible to our individual wishes and capabilities on modified the tour as required for our group. Through this tour, the four participating couples developed friendships that will continue into the future. A truly awesome experience that I will never forget. We had an excellent experience with CIMT and will definitely rent from them again. Everyone we emailed, spoke to or met were helpful, straightforward people. Simone in Florence is a great guy, very kind and honest and made sure we had the gear we needed. The bikes we rented were in excellent shape and exactly as described. You may want to bring your own jacket, gloves, etc. if you�re particular. I highly recommend this company. Friendly, professional and knowledgeable Francesco is the best! emails answered promptly with lots of useful information. We had a health issue during our trip and he went out of his way to help and support us. We thoroughly recommend CIMT. I rented a BMW R1200RT for 16 days. The price was fair, the bike was great, I was treated extremely well and I'll be happy to rent from CIMT again. Great company. I rented a Multistrada for half a day in Milan. Great bike at a good price. Thanks Rodolfo ! "very good. fuss free and helpful and bike was excellent"
Esperienza molto positiva. Ho noleggiato una R 1200 GS per 5 giorni. La moto era in perfette condizioni. Rodolfo (Milano) non solo � stato preciso e disponibile nella spiegazione di tutti i termini del contratto, ma � venuto a ritirare la moto in loco alla fine del noleggio durante una giornata estremamente piovosa e con un leggero sovrapprezzo. Posso senz'altro dire che CIMT � un'azienda veramente seria. Ripeter� senz'altro l'esperienza con loro. Bravi! We had a wonderful vacation in Italy. The booking process was easy from the very beginning. Thanks to patient Riccardo we had all information about our bike (payments, terms and conditions) and even more: good roads to go, must see places, etc. Our bike was waiting for us in the office with no delay. New Honda Goldwing, color blue, as we were promised. I even was offered rain trousers, as I forgot mine. After easy booking, after easy return process, after our unforgettable moto trip Rome-Napoli-Amalfi-Bari-Amalfi-Rome we must say it was one of the best vacation ever. I had a dream to travel in Italy by bike for a long time. And it was very important for me to find a good renting company I can rely on, just to enjoy the process (just sit and relax). CIMT is my first experience in moto travel. And it was excellent. Team is very friendly, polite and they definitely know what to do, how to serve you and how to advise you. Their key unique qualities: specific, prompt in answers, strictly to the point. Good example of post service we receive from them: when we returned the bike and payed all fees, they unblocked deposit on my card. When I arrived home, my bank was still keeping these money frozen. To speed up the process, Riccardo issued us the confirmation of money release. After that our bank unlocked our money immediately. Thank you for a good vacation. 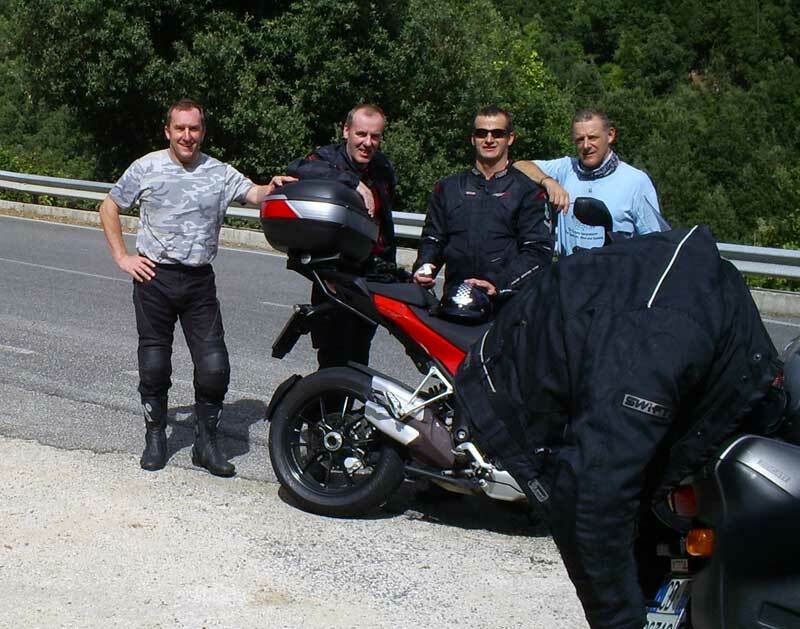 Just a quick note to say thanks, we had a brilliant week in Tuscany last week and the Suzuki went very well. We got to catch a stage of the Giro D�Italia but also got mixed in with the Mille Miglia twice, the older classic cars in Poggibonsi then by co-incidence, the Ferraris caught up with us on the streets of Florence. They were everywhere and you had to keep your eyes out to avoid them. Brilliant times. We dropped the VStrom off OK in Florence on Saturday, the guys in the garage were great and very helpful. We got the little DL650 a little bit dirty in heavy rain near Siena, filled up the fuel tank on the way back but could not find a petrol station in central Florence to top up the tank again at the end so it was only 3-4 bars full (maximum 5) depending on whether it was upright or on the side stand so just add that to the credit card bill. Sorry, I just could not find a fuel station and there were very fast driving Ferraris everywhere (130 of them!) so thought it safer to get off the road and return the bike. 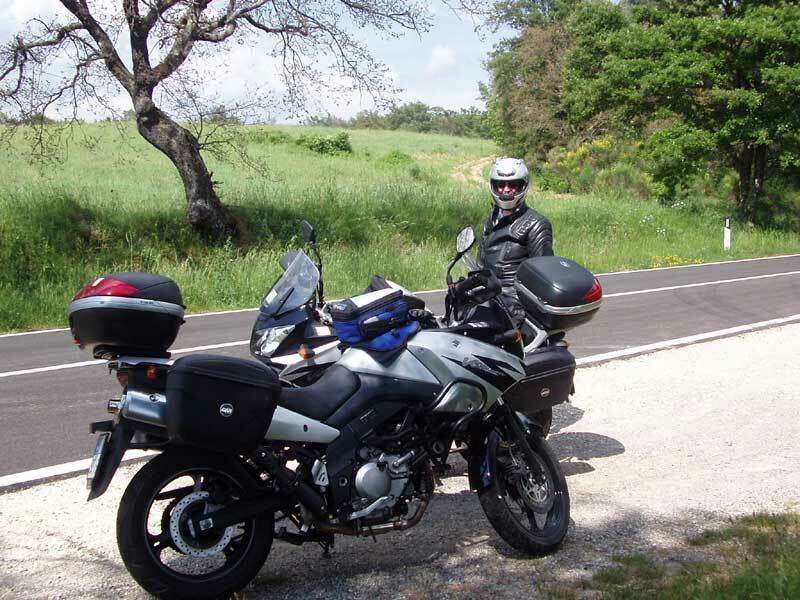 The Suzuki VStrom was a good bike for the roads down in Tuscany, not powerful with all the luggage on but still most of the time only in 2nd/3rd/4th gear on the tight twisty roads, roomy and comfortable plus the big wide bars made the bends fun. 758km of fun. Thanks for all your help and we will definitely be in touch next time we go for a riding holiday in Italy as we had a great time and picking up the bike was easy. I might try to talk the wife into a bigger bike next time! Safely home after a good visit in England. Just wanted to send you a note of enormous thanks for the fantastic time you created for us in Italy. Your excellent planning, choice of routes, hotels and restaurants, in addition to your amazing patience and great sense of humor, were all key to a wonderful tour. The trip far surpassed all our expectations and we will always treasure our memories of the beauty, adventure, fun, fellowship and food(!). It was so nice to get to know you and to know that we have a good friend in Italy for when we return. Hope you enjoy the attached photo of a brief moment of serenity on the Amalfi coast. Good luck with the coming season and safe travels. I am writing to say thanks once again. I had an amazing first impression of Italy and the people there all starting with renting the bike from you guys. Even my girlfriend Elisa enjoyed the trip now - we look back and laugh and spending most of a 24-hour period together on a bike riding halfway across the country. I have attached a few pictures from our trip to share with you the fun we had. I have been shopping for a bike since I've been back! 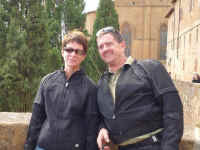 Thank you for meeting me to rent on a Sunday evening, for the info on Orvieto, and the general hospitality. I hope this is a great financial year for you guys, your families and your company! Please let me know that you received your disk-lock back in the mail. I would like to contribute a testimonial in support of the services you provided for me during the Southern Discovery Tour in October 2011. CIMT is a 100% top class professional service provider and Francesco is a man that leads his business from the front. You will not find a better motorcycle tour / rental provider anywhere. The bikes are top class. Hotels are great. Thanks for a great time. At 0900 on a sunny Wednesday morning, my wife and I were greeted by Lorenzo at an agreed upon location in Catania and after a quick set up we were already on our way on a Vstrom 650 towards Enna. After a short stop we headed slowly towards the Parco de la Madonie, in what might well be considered as one of the most beautiful parts of Sicily. We ended up on the first night at Petralia Soprana - a magnificent little village. In spite the village's beauty, there were no restaurants in it, a sign that there are hardly any tourists there and for the next four days of our trip we carried on with our desire to avoid as much as possible tourist traps. This was impossible to practice in Cefalu, but otherwise, we pretty much stuck to it. We might comfortably say that the best part of the trip was that almost nothing went according to plan, because there wasn't any. Everyday we rode 6-8 hours, took it real easy, and at about 1500-1600 started to look for a place for the night. The bike itself was in a very good condition and we had a trouble free ride. I always bring along with me my own set of tools, just in case, but this time the only tool we used during the whole trip was an adjustable wrench, and this was in order to crack open a bottle of beer, when a more standard opener was not available. At the discharge, we were met by friendly Vimar, and after riding 4-5 hours in the rain that morning, it was really nice to have someone extremely patient and friendly who gave us all the time in the world to get unpacked and organized to our flight back home. All in all, I was very happy with the operation of C.I.M.T . and would wholeheartedly recommend it. As for Sicily, apart for its beauty, I don't recall feeling safer with other drivers on the rode as in this place. They are surprisingly patient and accommodating to motorcyclist (but it goes without saying that this fact should not be taken for granted). Hope you feeling better now. I was told you where sick when I rang while in Sicily. Just a quick note to thank you & Lorenzo for a fantastic 6 days on the suzuki. No problems at all. The bike was brilliant & the luggage capacity brilliant. Sicily is beautiful & the roads challenging. We managed 1233 kms & only did 7 kms on the Autostradas. The rest on minor roads, avoiding all the tourtist traps..real rural Sicily..beautiful scenery & lovely people. Day 1 we did Etna, Gardini Naxos, Taoramina & stayed close to the Terralcantara gorge. Day 5 half day today..for a rest..south coast to see the beaches & coastal towns & back to Il Poggio for lunch & afternoon by the pool. Day 6 Headed north through Noto to join the ss124 & rode it to Caltagirone (magnificent) & then turned down the ss417 to Catania. Trying but so beautiful we didnt want to stop. I will reccomend Sicily to my friends, & once again many thanks to you & lorenzo (who was vey helpful) for everything. PS if you every want to tour Ireland you can hire bikes in Dublin & I would be happy to suggest some routes for you. 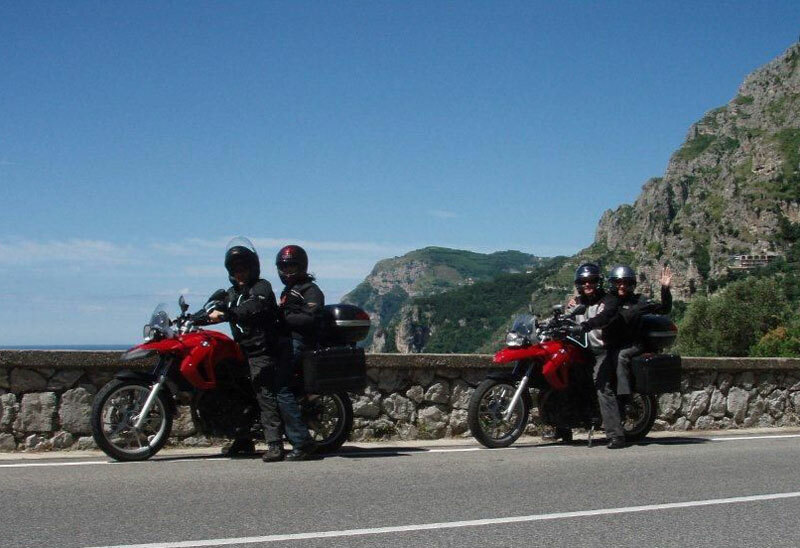 I recommend your hire service to other riders wanting to ride Italy. The bike was ready for me when I arrived in Sicily, behaved flawlessly, and Lorenzo who organised the pick up and delivery was also kind enough to deliver me to the airport for my departure. Sicily was great, people friendly, food marvellous, roads were a joy, and I was impressed with the way Italian drivers behaved toward motorcyclists, I'm looking forward to another opportunity to return and enjoy some more Italian riding. Love the new website (and great group picture), and wanted to add our heartfelt thanks for an incredible, worry-free adventure on the September 2010 Heart of Italy Tour! 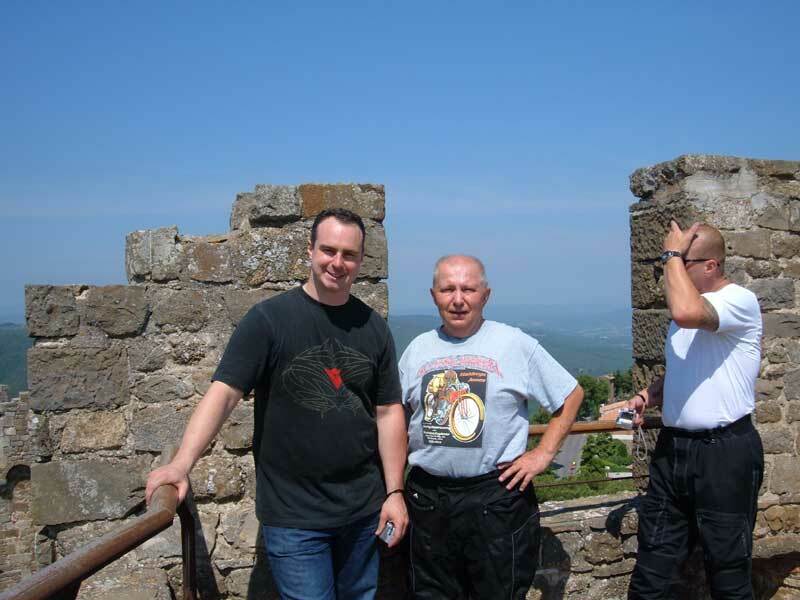 You and Gianluca took perfect care of every detail, from airport & luggage transfers, outstanding hotels, great restaurants, sightseeing opportunities, and most importantly, terrific riding. The Multistrada was flawless � I want one! - and it almost has me questioning my loyalty to Triumphs. More importantly, your selected routes gave us a great chance to experience the best of the Tuscany region, and the amazing twisties offered non-stop thrills. I tell my friends that was like a weeklong track day on the best roads in the world! We spent practically all day in the saddle (with just the right amount of breaks for coffee, lunch, photo ops and sightseeing), finished off each night enjoying wonderful meals and great company with our new friends, and woke up every morning rearing to go again. We weren�t sure exactly what to expect, but couldn�t have scripted it better. Also couldn�t have wished for a nicer group to spend the week with - hope to see you, Gianluca, Vince, Owen, Alex & Bev, John & Jane, Rich & Rhonda, and Paulo & Luisa again real soon on another tour. First of all� thank you to you and Gianluca for the wonderful tour you lead for us and our group. We had a phenomenal time, riding the twisties, enjoying the countryside, getting to know a new group of people and enjoying some fine Italian food and drink with all of you. Again� Thank-you! I've been home now for a few weeks and I just wanted to send you a note thanking you again for your excellent service. It was a pleasure to deal with you from the beginning and you made it easy for me to make my plans. The Multistrada 1200S was fantastic and well-prepared. They are hard to come by this year and I'm so glad you got yours in time for my ride. 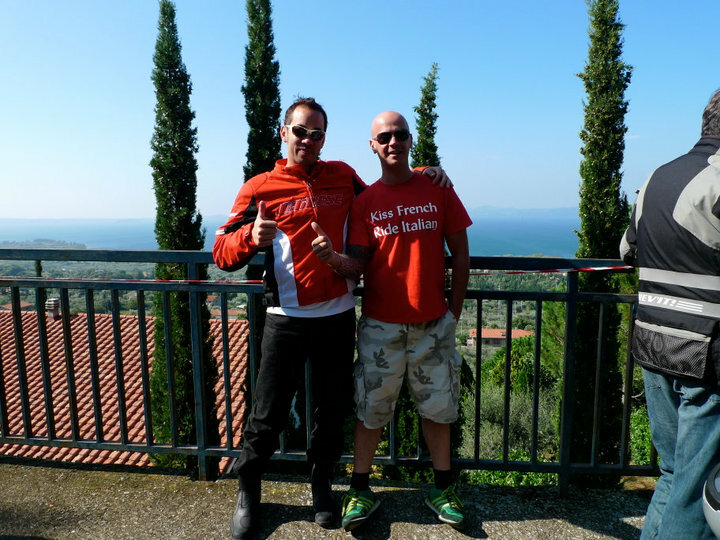 You and Gianluca were very helpful in suggesting routes which lead to a great 5 days of riding on amazing roads. I hope you have good luck with the MTS in your fleet and you continue to use them. I look forward to coming back to Italy for a longer ride and trying the roads I didn't get to this time. I would definitely book with CIMT again. 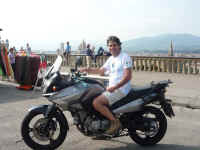 Just a quick note to thank you for the recent Heart of Italy motorbike tour yourself and Gianluca commandeered (September 2010). The tour completely exceeded my expectations (which were very high). The BMW F650GS (09 model) ran 1,700km like a dream. I really enjoyed the balance that you had on the tour between a very unique and structured programme, and flexibility for riders to "do their own thing" if they wanted to - which inevitably nobody wanted to ;). I'm sure the mind-blowing scenery and exquisite towns we visited couldn't have been covered on a non-motorbike tour or without your experience and understanding of the region. I was very impressed by the quality of the roads we covered - and the lack of traffic! 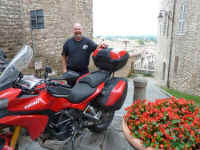 The accommodation was more than comfortable (after long days riding..) - the Arezzo and Orvieto hotels were outstanding! Finally, the quality of the food, dinners in particular, was a real standout - again your experience in this area was invaluable. I'm still fantasizing about the 4 finger thick T-bone steaks in Arezzo and the mouth watering home made Pici pasta in Siena! The help and advice you gave us in planning our route beforehand was invaluable and you saved us from a lot hassles, wasted distance and sore bums! Our initial intended route to the Alps would certainly have been the wrong choice. The bikes were in perfect condition when we picked them up and ran faultlessly during the trip. We mostly followed your recommended route via Sulmona, Norcia and Urbino on our way to Rimini. It is some of the best riding we have ever done (and here in South Africa we have very good riding terrain) and it is world class. The towns we visited were excellent places to stay and there was lots to do and see if one didn�t feel like riding long distances on the 2nd day. The nature reserves were awesome and the scenery that went with them. We would certainly recommend CIMT to anybody who was looking to rent a motorcycle from an extremely helpful and experienced company. I am happy to say my trip with your motorcycle was great. The pick-up and the drop off worked well and the motorcycle and the gps were without flaw. I am hoping to repeat this again next year! My wife and I have been riding in Italy and renting motorcycles from CIMT for several years. 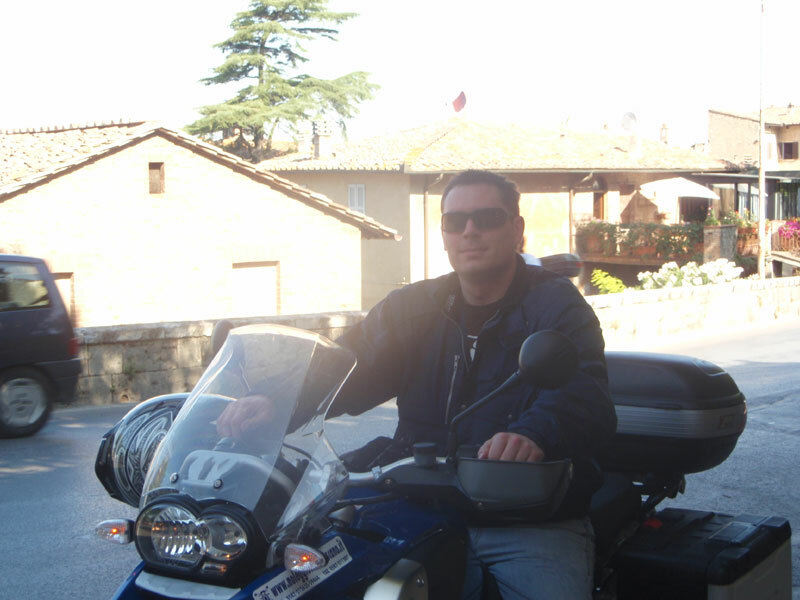 Francesco always provides us with excellent service and a well maintained motorcycle to ride. It is by far our favorite way to spend a vacation. We always explore new areas on beautiful roads, meeting friendly people and eating fantastic food. 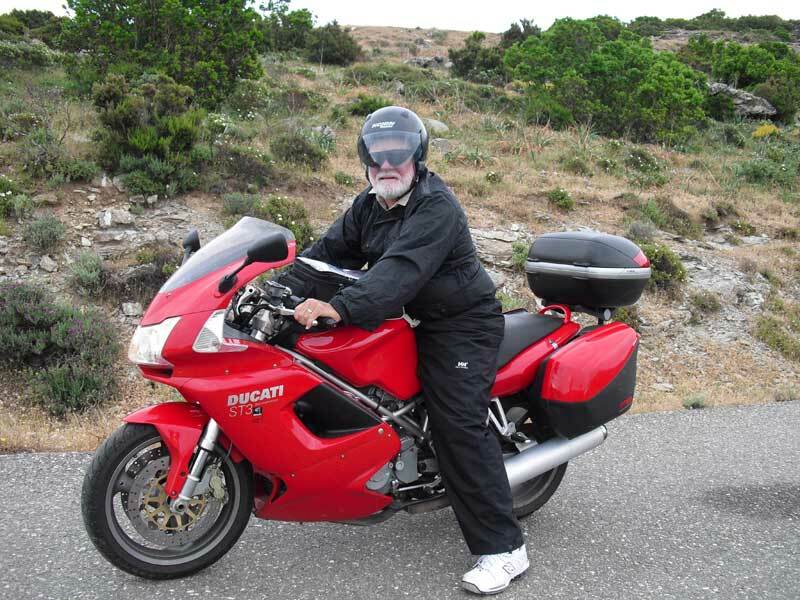 We love the mobility and intimacy of riding a motorcycle in Italy. 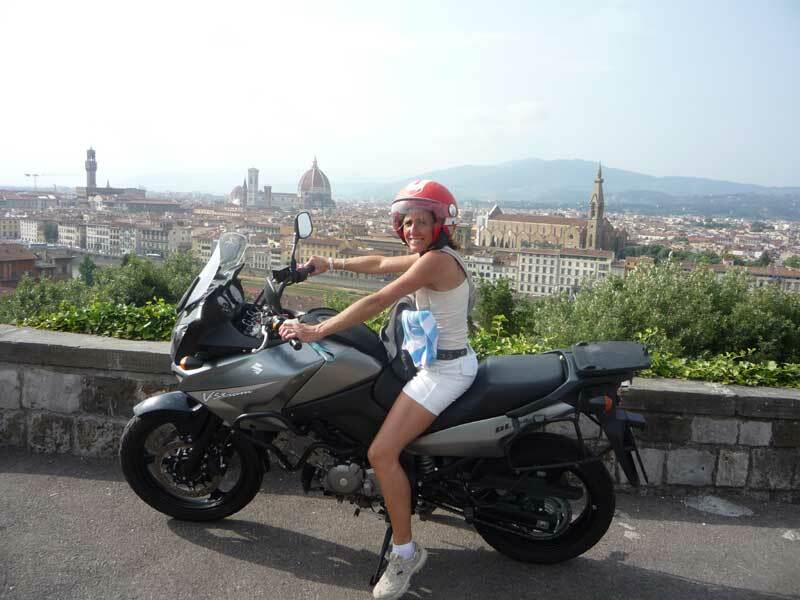 There are few places in the world that I feel safe riding and Italy is for sure motorcycle friendly. Now if we can only find a way to ride through Rome without getting lost...Ha! Thank you again. Thank you for all your help during our recent tour, the bikes were trouble free and we all really enjoyed the trip! hopefully next time we will try the roads further North of Rome and spend some more time over there. All in all it was a great experience and we would recommend your company to anyone planning to tour Italy! This Italian touring was an amazing experience for me. I can't speak English very well. Moreover, English can�t be so spoken in Italy. I was interesting though it was very serious to take communications in Italian. I stopped by Rome, Naples, Amalfi, Matera,　Alberobello, Leuca,　Gargano, San Marino, Maranello, and Florence. The surprise and impression had been filled in any place of stay. I will not forget this travel at the life. 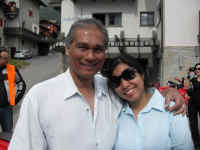 So I will visit again to travel around Northern Italy. I wish to express my gratitude to you who gave me this chance. Thank you and all motor cycle riders. With a huge delay I am writing to thank you for the 2 beautiful experiences Joelle and I have had this year thanks to CIMT. First was our self guided tour of Sicily back in April. The excellent condition of the BMW 1200 RT that you gave us and your valuable tips and recommendations made our 7 days tour unforgettable. So much so that barely had we returned home we immediately started planning the next one!! Second was the Alpine tour in July. Again perfect material and organisation, wonderful itineary and hotel choice were the ingredients of a memorable week. The tour participants were all amazing people and not to forget Umberto who added his own charming note to all of that! You know it often happens that when you enjoy something a lot you want to repeat it. however it rarely happens that when you do repeat it you get the same pleasure and satisfaction out of it. Well with CIMT and the team, but more particularly with you Francesco, second time was as good, if not better, than first! Our sincerest appreciation to you, Umberto and your team for the Alpines 2 tour. It was fabulous and the memory is still fresh in my mind, even though my client is pushing more and more work my way ! Sarina and I love Italy, all the more so, after spending time with you and Umberto. We have already been thinking about our next trip with CIMT in Italy, in Spring. This time maybe in the Spider. Keep well and God Bless. Back in Brazil now, we would like to thank you both for the wonderful experience we had in riding through the Alps with the "High Alpine Tour-Part II". Your assistance, your kindness and full experience, was a plus to our trip. But stay put, adventure has just started; we'll for sure be contacting you again for another great ride !!!! Come stai ? Hope you are well and your business is going OK. We just wanted to send you a quick gooday message and to thank you from all of us for your assistance in making our trip fantastic. 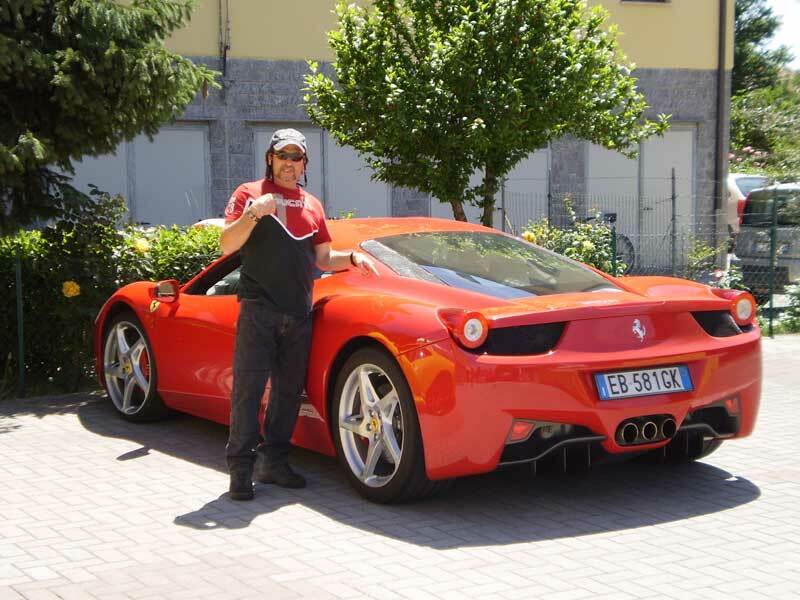 You and Diego were very helpful and we are glad we went with you and took the BMW rather then the Ducati. 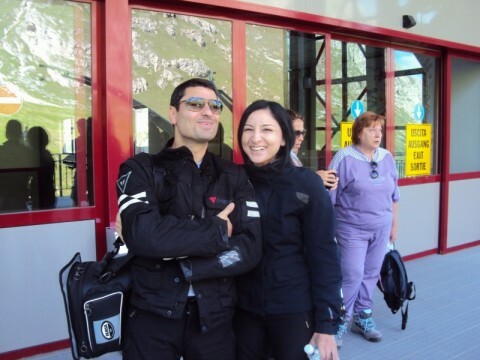 But next time its the alps on the Duc....Say hi to our good friend Diego. I would love to do a trip with just you two, it would be fun. Starting to heat up over here so off to Phillip Island for the GP next month. 1,100 km one day on the ST4s and a handful of speeding fines.That's life. PS. we watched the motor show "Top Gear " on television last Tuesday and the new Ferrari 458 Italia was featured and received great review. I shouted the news to all my friends that i drove it before Jeremy from Top Gear did !!!!! Thank You for the road tips to Piemonte/Cuneo/San Remo/PortoFino with the BMW RT made in 17/may till 27 2010. Thank you Francesco for showing us Italy in the best possible way - with a local! We have had the best motorbike ride, seen the best sights & eaten the best food! Thanks again for the easy drop off at the airport today. I made my flight even with that amazing traffic. I enjoyed riding the Ducati and want to ride it again but head north next time to more rolling hills and corners. I wonder how you warn or alert riders to the ways of the Italian riders/drivers. It is amazing to be in the streets of Napoli and have scooters coming straight at you and passing you on both sides. I LOVED it, it actually was fun to be part of the bike and scooter traffic passing cars on the short straights above Sorrento and Amalfi. I was not used to being passed by 125cc scooters though. They would pass on blind corners and just split lanes where I would swear that they could not fit, they did though. As for the Ducati, the low end torque was really fun in the corners once I found how to use it wisely. I have added couple pictures here for your collection. Thanks again and I hope to see you again next year. Apologies for the delay in getting back to you, I have just returned to Australia and managed to download my photos. reference the below as a testimonial. Once again I would like to thank CIMT for making everything so very easy. The riding in Tuscany is some of the best I have found anywhere in the world, and the people, scenery, food and wine is quite simply amazing. edge of town to ensure I found the correct road south. 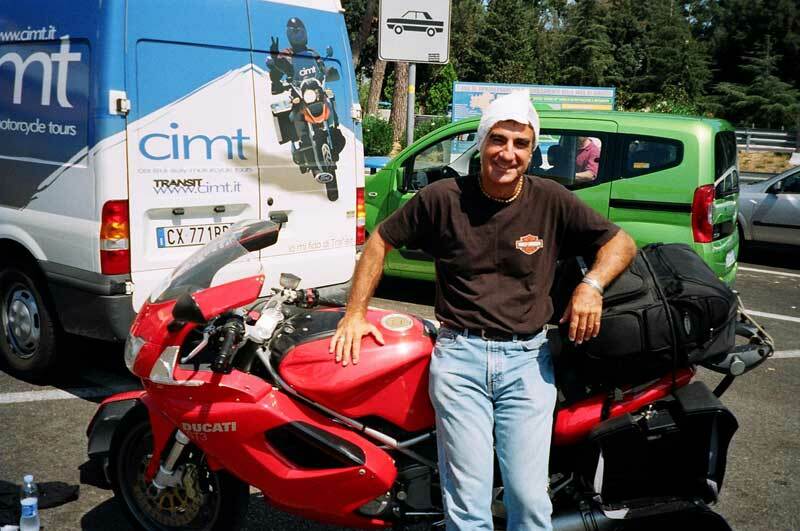 I would highly recommend CIMT and Roberto to anyone considering a riding holiday in Italy. I will definitely be back! We had a magnificent trip that we won't forget for a long time. We were impressed from the good attitude and magnificent views that only a riding on a motorcycle can emphasize. Everything was just as good it can be (and we liked Italy more then any other place). We already decided to do it again so we're looking forward for the next time. Thank you for everything, and also for Diego that was wonderful. How are you? I hope that all is well. I just wanted to say thank you for the excellent service you provided for the bike rental. It really helped make this a great adventure and vacation! I have attached the photo you took of me, after getting out of the hospital .. for your scrapbook ! Grazie tanto ... Best Wishes Always! I'm back in the States with temperatures over 40 degrees--why people live in Texas and Louisiana baffles me. It's NOT a nice change from the cool temperatures in the hills of Tuscany. Life and work, however, must go on. the cities. Kathleen wants me to buy one. In truth, I think she wants one of her own! kilometer reading, so I never noticed whether I went over the daily allowance. However it worked out, it was worth every Euro. Your professional and helpful approach was exceptional and provides ample incentive to repeat the experience. Thanks so much for your vision to offer this kind of riding! we had a wonderful motobike tour. 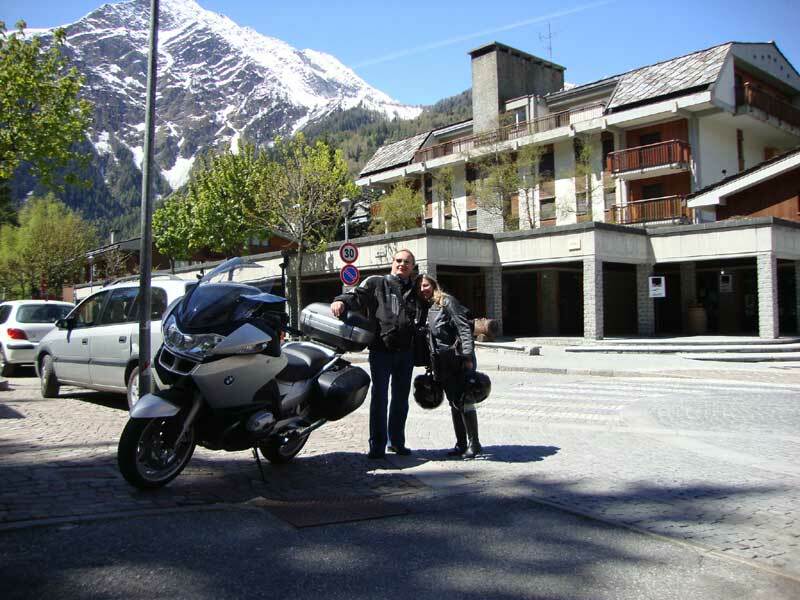 Thanks to your perfect organisation we could start early in the morning on saturday and had a beautiful ride around the como lake and then on little narrow roads to St. Moritz, Livignio and finally to Bormio, where we stayed for the night. 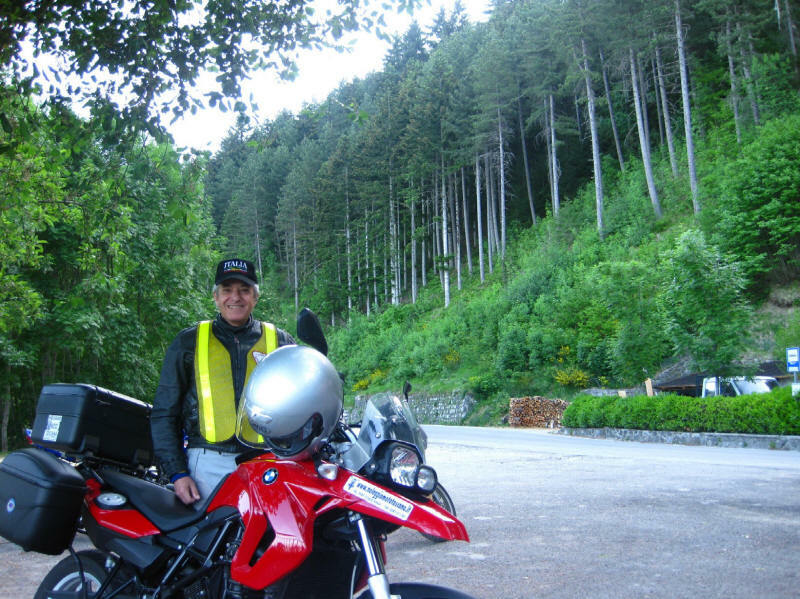 On sunday morning we got to Passo di Gavia, which was breathtaking (although it was only 5.5� Celsius---and then Peter showed me that the BMW has heated grips----what a fool I was!! ), and all the way back to Pogliano, where Diego and the taxi where waiting. The slogan "rent a dream" was definitely true! Thank you very much for your support, this was probably not the last time we rented a motobike from you! Just to say thanks for the excellent service on my recent visit. The route you suggested was perfect, the bike was great and very well specified. Diego looked after me superbly, painless and friendly pick up and drop off, good advice and welcome ice cold bottles of water when returning on a hot Sunday afternoon. I very much look forward to booking with you again soon. Just a note to thank you again for the fine service (and Ducati!) you provided Gail and me for our European adventure. Your advice, assistance and support was the best. If you're coming to Florida please be sure to get in touch. Camilla and I are back in the USA. I just want to tell you that everything about the bike rental was great. 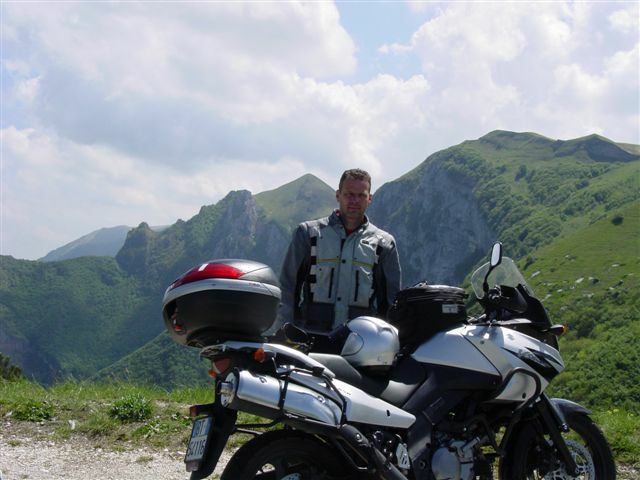 The process was easy, and the bike (BMW F650GS) was perfect for the roads of Garfagnana. Roberto was kind to recommend his favorite spots and roads. After Garfagnana, we visited Camille's family in Isernia. Molise looks even better than Garfagnana for riding. Hopefully, we can do a trip there. 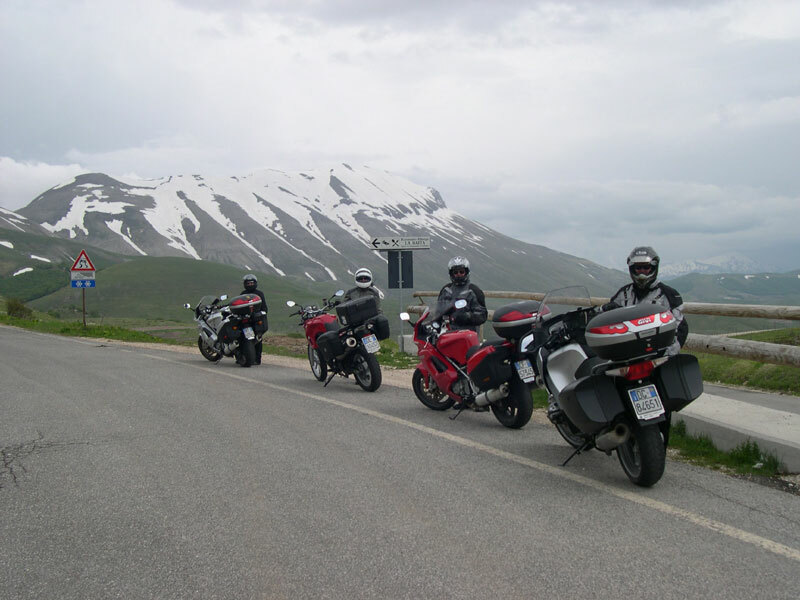 We drove SS 627 out of Isernia and then several roads to the south of the Parco d'Abruzzo Lazio e Molise. Beautiful scenery, easy to drive and interesting things to see along the way. I've attached a few photos from the trip. Do I look like I am having fun? I just wanted to thank you for all your efforts on our behalf. 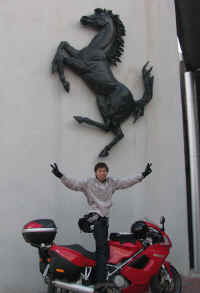 I know that you really worked hard to make things right with all the unfortunate happenings with Julie's Ducati. I could not have asked you to do more. You drove most of the day to get the first repaired bike up to Montepulciano. You arranged to have the Siena dealer work as long as necessary to repair the bike. You drove most of the night to retrieve it from Fivizzano and bring Julie a much appreciated replacement bike (which you also arranged for in an emergency), all while you were conducting a tour of your own. Your refund schedule was well thought out and fair, and I appreciate that. It was unfortunate that Julie's bike had so many problems, but you cannot control that. What you could control was your response to those problems, and in that regard you did a superb job. As a result, I would not hesitate to rent from you again (but no exotic Ducati's, just boring BMW's or Honda's) and I will not hesitate to recommend you to others. Thanks again, and I hope you have a great season. The entire rental experience was great and informative. Karen, Roberto and Mario were very helpful in all regards, from starting the initial process to checking the bike back-in. Karen answering all my questions. Roberto holding some of our motorcycle gear for a few days. Mario giving me a few Noleggio Moto stickers, which I plan on displaying on my R1150GS. I would not hesitate in recommending CIMT to anyone who is looking to rent a motorcycle in Italy. ps. 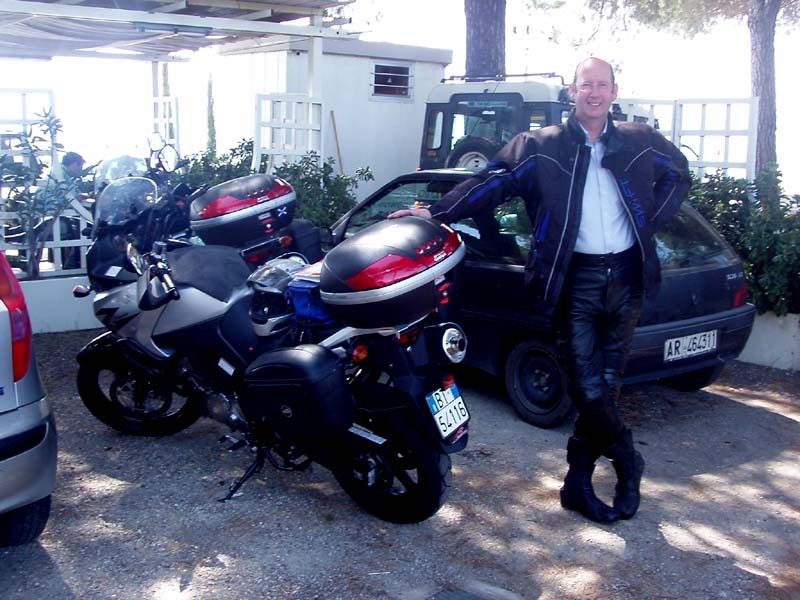 I have sent two photos and the caption could read, "Too many beautiful places to ride - too little time"
My friend Bill and I rented a couple of V-Stroms from CIMT in Spring 2005 and again in 2006 and hope to return. 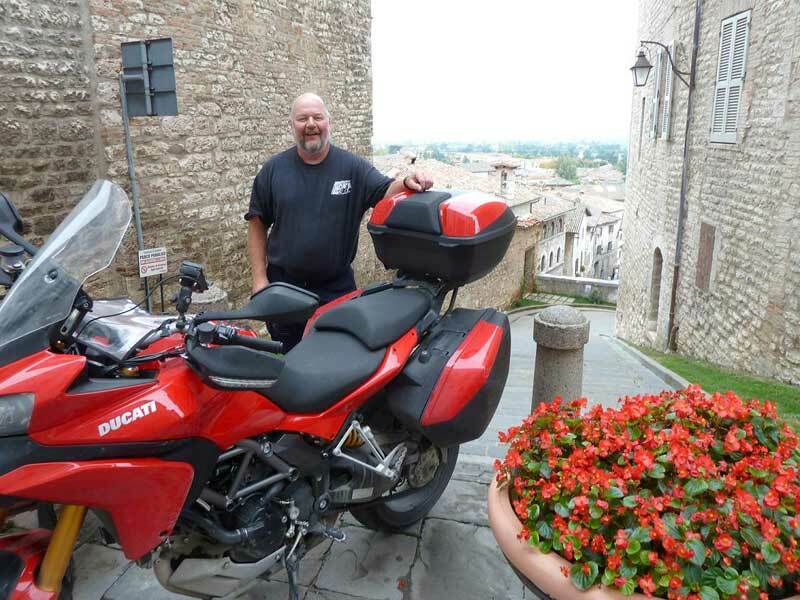 Francesco is a very pleasant, friendly, helpful chap, who genuinely will do his best to ensure you enjoy touring his beautiful country by motorcycle. The bikes are well-maintained, regularly serviced, and should be trouble-free. On the one occasion we had a minor breakdown ( my fault ) Francesco was superb at communicating by mobile phone with ourselves, Europe Assistance, and then the local Suzuki dealer so that we were back on the road within 2 hours when I thought we would lose at least a day. He also has a fair and transparent policy on any accidental damage ( again personal experience - same minor incident !) so you don't have to worry about your credit card being debited by some mysteriously large amount with no explanation. Don't be apprehensive about riding in Italy. Sure, the Italians drive fast and a little chaotically at times, with loose interpretation of speed limits and white lines - and the traffic flows all the better for it ! It's invariably good-natured and unaggressive - you'll fit in just fine. As long as you give them respect you'll find Italian drivers very biker-friendly - there's a little bit of Valentino in the heart of every Italian motorist ! 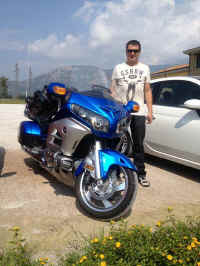 So don't hesitate, have no worries, book with Francesco with confidence - you'll have one of your best biking trips ever. The silver 650 V-Strom ran very well the entire trip. It's a very nice bike for travelling the back roads of Italy. Everything was great! I'm thinking about buying a 650 V strom or a 750 Honda Transalp. They are great, dependable all around bikes. If we could ever re-live just 7 days of riding, it would be on the this CIMT tour. If we ever could re-live 7 days of eating and drinking, it would be on this CIMT tour. If we ever could re-live 7 days of any holiday experience I've ever had? You get the picture! The roads, the hotels, the food, the wine and the culture but most of all the unbelievably friendly and professional service we got have transformed our ideas of what a motorcycle tour should be like. We won't tour in Italy again without going with Francesco and CIMT. 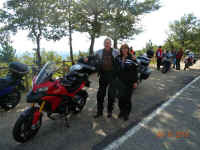 Pillion friendly and good enough to scrape pegs on the umpteenth hairpin is the only way we'll see Italy again! Francesco, if you need a guide for this tour next year, give us a call! 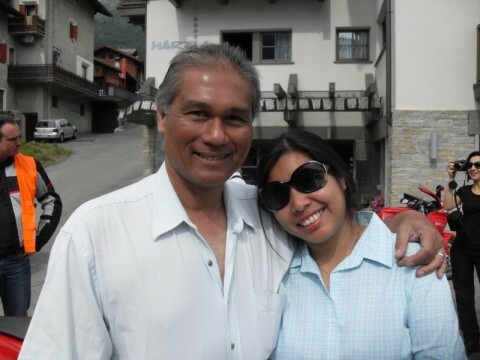 "My wife, Jean, and I had our absolute best vacation ever when we travelled Italy with you and your company, CIMT! We had no idea how much fun it would be to travel with someone whom we did not know, nor were we certain that the route or accommodations would be so top notch. A trip like this could easily have been a disaster. 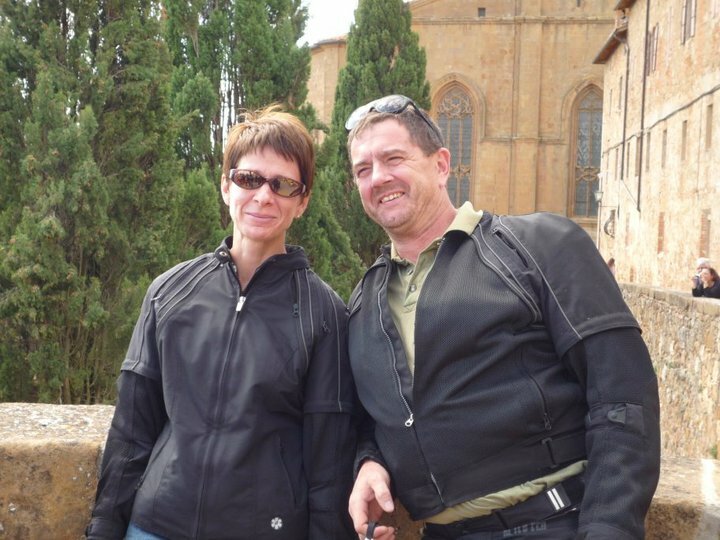 You are the reason it was great and you are the reason that we would only choose CIMT when we rent a bike or tour in Italy." Hi Francesco!!!!! Well now it seems to be my turn for computer problems, but it's up and running now. I just knew your word was good, and now I'm even more sure that my Alpine adventure will not be with anyone else but CIMT. Ahh. Siena and the Guzzi, what wonderful memories I'll cherish forever. I MUST take my wife to see Siena someday.